As competition intensifies, there are increased risks that the information we provide may adversely affect our own businesses. Analysts tell the Wall Street Journal that the change in reporting practice was “probably due to its continuing legal battle with Apple”. As you know, Samsung is embroiled in a tough legal spat with Apple which accused them of ripping off the iPhone’s hardware, software, design, packaging and even marketing. In that respect, it would make sense for Samsung to hide sales numbers because they are growing at an astounding rate and with an IDC-estimated second-quarter smartphone sales of 19.2 million units they indeed are within spitting distance of Apple’s record-breaking shipments of 20.34 million iPhones. In fact, several research firms warn Samsung’s 500 percent unit growth versus Apple’s 142 percent growth suggests that Samsung most likely will overtake Apple this year to become the world’s #1 smartphone maker. The decision to cease reporting phone sales could also stem from failed expectations as Samsung’s top brass might have been convinced they would outsell Apple this quarter, as Boston-based Strategy Analytics wrongly predicted. Seeing the Apple hype machine at work and bloggers rave about iPhone milestones, it is entirely possible that Samsung’s leadership concluded it would be in their best interest if they withheld sales data. 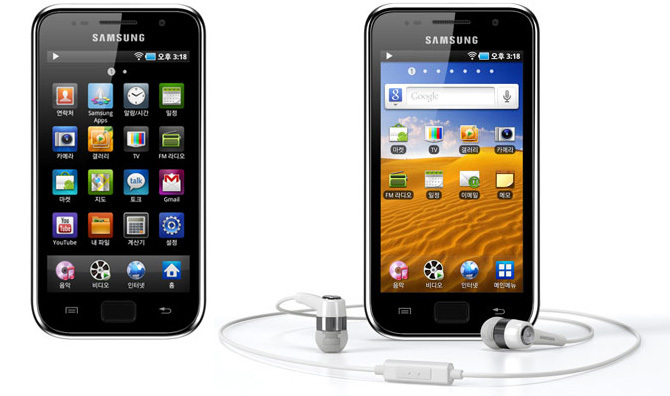 Above: Samsung Galaxy Player, one of the gizmo’s Apple says blatantly copies iOS gadgets. Per latest IDC and ABI Research second-quarter cell phone survey, Samsung shipped an IDC-estimated 19.2 million smartphones in the second quarter of this year. In the year-ago quarter, the company moved just 3.1 million units, so they grew an astounding 500 percent on an annual basis. Apple reported shipments of 20.34 million iPhones in the second quarter, up from the 18.64 million iPhones shipped in the previous quarter and representing 142 percent unit growth over the year-ago quarter. In terms of market share, Apple captured an IDC-estimated 20.3 percent share of the smartphone market in the second quarter versus 19.2 percent for Samsung in the industry that shipped 110 million smartphones in the June quarter.